What Window Blind Style is Best for you? Roller blind, Roman Blind or Venetian Blind; they are all blinds and they will all do the same kind of thing which is to block the light and to provide privacy. There are however subtle difference in the way each of these products function. The purpose of this section is to help you understand these difference and for you to choose the style of blind not just because of price but because of function too. All the window blinds that we sell on line, operate in a vertical or up/down motion. The stack size is the size of blind when it is in the up position. Stack size is important to understand because this may influence where a blind is fitted and the size that you request. There is no point for instance putting a Roman Blind in a doorway reveal that has 2100mm height because it will reduce the door clearance down to around 1770mm meaning you will need to duck to get through the door. Instead because you now are aware of stack height, you would probably put the blind above the doorway. A roller blind will provide a fairly consistent stack at of between 80mm and 90mm. An Aluminium venetian blind will vary because each horizontal slat adds to the stack height. A 2.0m high aluminum venetian blind will have a stack or around 115mm. A 63mm wide Visionwood blind has less slats than the same height 50mm Visionwood blind, therefore, a 63mm Visionwood blind will have a small stack height than the 50mm venetian blind. Roman Blinds fold up from the bottom in horizontal panels. Roman Blinds have a fairly consistent stack height of around 330mm. When a window blind is installed, it will project out from the wall by a certain distance. The amount a blind projects out at the top may be different to how it projects out at the bottom when it is fully down. Projection is important because there may be obstacles like door handles or railing in the way that may impact the function of the blind. A venetian blind has the same projection at the top as well as the bottom. The projection approximates to the width of the slats plus the bracket gap behind the slats. A 50mm visionwood venetian blind will project out approximately 70mm at the top because of the fasia. From about 70mm down from the top the blind holds its projection at around 60mm. A 49mm Cedar venetian blind will project out approximately 70mm at the top and from 70mm down from the top, it will project out approximately 60mm. Venetian blinds are construction of a series of horizontal slats. Each slat will have a light gap and there will also be a projection gap as well as a gap around the edge of the blind. Each slat has holes to enable ladder tapes to pull the blind up and down. These holes will also let through light. The longer the drop of a venetian blind the bigger the slat gap is for the bottom most slats. When you order a venetian blind that is 1200mm wide the slats will come 1200mm wide, like the roman blind, we suggest you take approximately 10mm off the width to avoid having a blind that won’t fit inside the window. 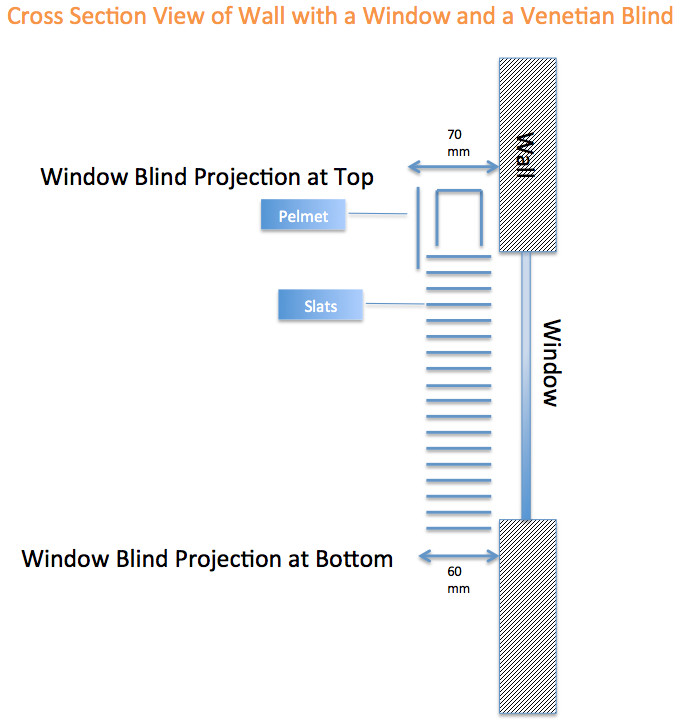 Venetian blinds operation in two dimensions. Firstly the venetian blind slats can be raised and lowered. Secondly, the venetian blind slats can be tilted to open and close. The ease of raising and lowering a venetian blind depends on it’s weight. An aluminium venetian blind is quite light in weight therefore the raising an lowering of the blind is quite easy. A vision wood blind is a little heavier and the bigger the blind the heavier it is. A large Visionwood venetian blind or Cedar venetian blind can require the effort of two arms of a healthy person. If the blind is required to be raised and lowered often (eg because it is in a doorway) then be mindful of the weight. The tilt operation of a venetian blind is very easy and light weight. Other than fabric choice, a blind can either be up or down, open or closed. Roller blinds and roman blinds can only go up or down. A Venetian blind can go up and down but also it can open and close by adjusting the pivot of the horizontal slats providing great flexibility for privacy control. Window blind durability is an important consideration in your purchase. Whilst one blind style may be cheaper than another it may in the long run, be better to go with a different style of blind because it is better able to cope with the knock and bumps the it may be subjected to. Roller blind and Roman blind are quite durable and should last a good while; given that they are not maltreated in anyway. The fabric is the biggest consideration for roller and roman blind and their durability. Some of the fabrics in our deluxe range are treated for stain protection, others are because of their composition are very easy to wipe down . Aluminium venetian blinds can last for many many years but the slats are the weak point. The slats can bend and stay bent if they are jammed or intentionally mishandled. Visionwood venetian blinds are extremely durable and colour fast. The main issue with Visionwood venetian blinds is cleaning. There are thankfully many cleaning accessories in the market that lessen this disadvantage. They do not easily bend crack or warp. Cedar venetian blinds are made from natural timber and have been pre-oiled. The slats will last for a long time however it is recommend to re-oil the slats every two years. Window Blind ventilation is about the blind being able function with the window open and a breeze gently blowing through. Roman blinds are much softer and whilst they will move around, they are less likely to knock and bump. Aluminium venetian blinds will rattle if the window is open to the breeze. The use of hold down clips will stop the knock and bump effect. Visionwood venetian blinds are less likely to make a noise if the window is open to the breeze. Use hold down clips to stop the knock and bump effect.